Manufactured and fully assembled in Columbus, Ohio, the Rogue RH-2 is a reverse hyper machine designed to meet the unique, changing needs of the athletes it serves. Widely utilized for physical therapy and back rehab exercises, the Reverse Hyper can also be used with light weights in everyday training to reduce lower back tightness and strengthen hamstrings, glutes, hips, and more. The Z Hyper, an adaptation of the RH-2 with a bolt-together design, 3x3” 11-gauge steel construction, and adjustable handles, is also available. 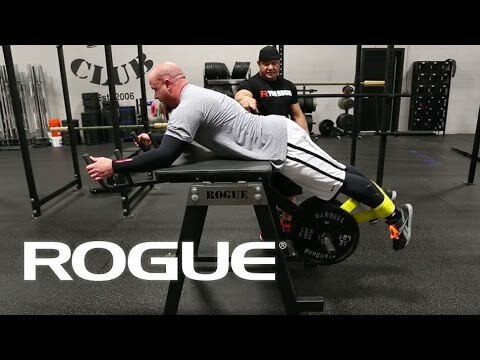 Rogue’s Reverse Hyper decompresses the spine without enacting any vertical compression on it, allowing for dynamic strength development in the concentric phase. The spine is gently stretched and depressurized during the process, creating—in essence—an internal pumping mechanism, filling the spinal column with spinal fluid and the lower back muscles with blood. By strengthening the lower lumbar, athletes can improve their recovery times and endurance, allowing them to train longer with reduced soreness. RH movements can have similar benefits for the glutes, hamstrings, hips, and more. Anyone who has injured their back knows that the pressure needs to be relieved and circulation restored to the injured area in order to rehabilitate. The reverse hyperextension machine offers one of the best methods for achieving this. Just as it serves as a dynamic strength developer in the concentric phase, the RH-2 is also an ideal rehabilitation mechanism in the eccentric phase. Some athletes trust the RH-2 as a way to focus on hip extension when rehabbing from a foot, ankle, or knee injury, as well. The RH-2 is manufactured in the USA, utilizing 2x3” (legs and swing-arm) and 2x2” (base) steel tubing. The legs feature a welded-on step to assist in getting onto the unit, and the 3” thick pad is designed with a cornered style edge, protecting the user’s hips from any contact with hard steel. For the handles, we used 1" solid round steel with 6" long rubber grips and multiple hand-holds to accommodate varying user heights. The entire unit ships fully assembled, complete with a laser-cut Rogue nameplate. All you have to do is bolt on the protective rubber feet, which help prevent floor damage and restrict any movement of the machine during use. The RH-2 is compatible with both bumpers and steel plates at any any increment, including 45LB steel. There is 10.5” of plate loading capacity on each side of the swing arm, enough for over 700LB of steel plates. Need a new set of plates to go with your reverse hyper? Check out our Rogue Steel Olympic Plates, or our Hi-Temp or HG 2.0 bumpers. Not only is the RH-2 delivered fully assembled, it also comes standard with HG Collars and a Spud Inc Hyper Strap, so you can get to work: day one, hour one. Customers have also have the option of adding a compatible roller attachment to their order at an additional cost. The Rogue RH-2 Roller Attachment features a quick release design for easy transitions from the hyper straps to the roller system. Ordering from Rogue ensures fast, professional, secure delivery of your Reverse Hyper from our Columbus, OH, warehouse. The package ships freight, fully assembled and bolted to a skid (total weight: approx. 206LB), with online tracking available via the Rogue Shipping System. RH-2 Rogue Reverse Hyper is rated 4.8 out of 5 by 21. Rated 5 out of 5 by sendit_kevin from Holy back pump!!! This machine is very well built and will last forever. Nothing else can come close to strengthening your low back. It delivers such an intense pump to that area. Rated 5 out of 5 by coachcodyfla from 4 year review***** I bought the reverse hyper 4 YEARS ago and I am impressed with it. I use it 4-5 times weekly and have steadily made gains with it. The craftsmanship is of Rouge quality - so it can be trusted, used and abused. I keep 350 on the pendulum which you will end up doing as well. the cons of the RH are: 1. it is a bear to load and unload - just buy dedicated weights for the RH and leave them on it - save smashed fingers and curse words (lol) 2. you got to go to [email protected] and buy a grease gun to lube it wd40 will not do and is not recommended 3. the weight arms are slightly smaller than collars so you have to adjust the belt and weights after a few sets - but this is nothing Pro's 1. back pain gone 2. I can walk after heavy squats/deads 3. 0 rust 0 problems lube it once every few months so super easy 4. dead/squats are way up from when I started so I feel good Overall this is a solid addition to my garage and I constantly use it. I would recommend this to the avid lifter who lifts heavy or needs to help/improve "back health". Rated 5 out of 5 by LorB from Works great. After spending thousands of $ on chiropractor, message and therapy treatment this thing is worth the money. I do 3 sets in the mornings and evenings. Back feels better then it has I years. I don't know why no local commercial gym have this machine. Rated 5 out of 5 by 1dvsdude from Love it! I’ve had this machine for about a month and really love it. Rated 5 out of 5 by Squid from I'd like one, just to costly I use one at a buddy's gym. I use it to warm up before doing legs and then 4 sets after. I do this when I can and use my Teeter Hangups and hang upside down on chinup bar. Rated 5 out of 5 by Mike schook from Great piece of equipment for powerlifting I've had it for 2 weeks and deadlifts and squats are both easier for reps and weight (600lbs). Tip notch solid piece.